The following is from the May 23, 2016, edition of The Dallas Morning News. Regina James, an associate director at SMU’s Hegi Family Career Development Center, and Bernard Weinstein, an economist and associate director of the Maguire Energy Institute at SMU’s Cox School of Business, provided expertise for this story. On a recent Tuesday afternoon, the denizens of Southern Methodist University’s campus seemed to move at a leisurely pace. A few cyclists clicked along the pathways and the stately brick buildings, with their bright white colonnades, were quiet. Commencement had taken place a few days earlier. But for Regina James, the busy season was getting into full swing. James is the associate director for employer relations at SMU’s Hegi career center. Experts say newly-minted college graduates in the Dallas area are entering one of the best job markets they’ve seen. But James said that’s no excuse to slack off in the hunt. “We encourage students to have multiple internships for a number of reasons,” she said. “You’ve got to think about it as, not only are you competing against your peers here, you’re competing against peers from other institutions in the area, you’re competing against institutions nationally [whose students] may desire to live in the Dallas area.” . . . In Dallas-Fort Worth — one of those metro areas with a low unemployment rate — there’s extra momentum, said Bud Weinstein, an economist and associate director of the Maguire Energy Institute at SMU’s Cox School of Business. The region’s economy is more diverse than it’s ever been. And more companies are relocating or expanding in North Texas — in part because they’re attracted by the area’s talent pool. Students should mark their calendars for the last Career Fair event of the academic year, sponsored by the Hegi Family Career Development Center. The event will take place on Tuesday, April 12, from 3 to 5 p.m. in the Hughes-Trigg Ballroom. At the event, students will be able to network with employers who are recruiting for both full-time and internship opportunities. Students are encouraged to come prepared with resumes printed and research completed. Counselors at the Hegi Center can help students prepare for the event. SMU students shared the results of their research with other students and guests at the annual Research Day on Feb. 10. Learn more and see a list of winners at www.smu.edu/researchday. At the Spring 2016 Career and Internship Fair on Thursday, February 18, students will have the opportunity to network with over 75 companies, including Southwest Airlines, Peace Corps, EY, Epsilon and Sendero. Sponsored by the SMU Hegi Family Career Development Center, the fair is set for 4 to 7 p.m. in the Hughes-Trigg Student Center Ballrooms. Students had the opportunity to meet with more than 90 employers representing a range of industries at the February 10 Career and Internship Fair sponsored by SMU’s Hegi Family Career Development Center. Learn about the Hegi Career Center’s upcoming spring career and internships events here. Watch this and other Mustang Minute! videos from SMU News’ Myles Taylor here. 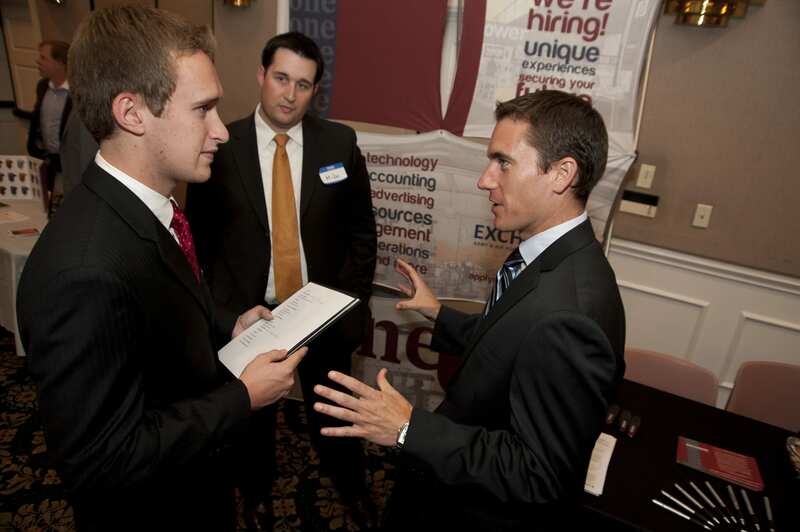 At the Spring 2014 Career and Internship Fair on February 24, students will have the opportunity to meet 117 companies and network with more than 225 employer representatives. Employers attending include the U.S. Department of Labor, Neiman Marcus, Peace Corps, McAfee Inc., American Airlines, KPMG, Citi, Ernst and Young, Deliotte, JCPenney and many others. Sponsored by the SMU Hegi Family Career Development Center, the fair is set for noon to 4 p.m. at the Hughes-Trigg Student Center. 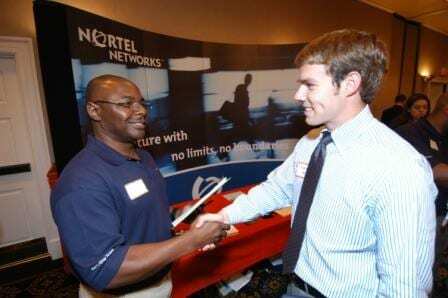 At the Fall 2013 Career and Internship Fair on September 19, students will have the opportunity to meet 112 companies and network with more than 270 employer representatives. Employers attending include the U.S. State Department, Neiman Marcus, Peace Corp, Scribe.ology, American Airlines, General Motors, KPMG, the FDIC, Ernst and Young, Deliotte, Hitachi Consulting and many others. Darin Ford, director of the Hegi Career Center, says the event will open a variety of door for all SMU students, whether it is their first semester or their last. “Students are four times more likely to receive a job or internship offer if they have networked with someone in their dream company,” he says. The center is offering extended drop-in hours – from 10 a.m. to noon and 1 to 4 p.m. – to help students prepare through September 18. The spring Career and Internship Fair sponsored by the SMU Hegi Family Career Development Center brought hundreds of students and alumni to the Hughes-Trigg Student Center to meet with more than 100 employers, including finance and insurance firms, technology and engineering companies, retailers, nonprofits and government agencies. Before the fair, the Hegi Career Center offers a Career Prep Day, where students participate with employers and alumni in events including Resumania and Speed Networking. Career counselors encourage students to begin exploring internship opportunities and the career development process during their first year at SMU. “Today’s employers want to see not only solid GPA and campus involvement on students’ resumes, but also multiple relevant work experiences,” says Darin Ford, director of the Hegi Career Center. Learn more about career development resources at smu.edu/career. More than 100 employers are participating in SMU’s Career and Internship Fair on Thursday, September 20, from noon to 4 p.m. at Hughes-Trigg Student Center. Janet Lewis, assistant director of the Hegi Family Career Development Center, advises students to make a plan before the fair about the employer representatives they’d like to visit so they can use their time efficiently. Students can find a list of participating employers here.